11 of us set off this morning on a not so easy ride heading out into strong head to cross winds. Simon R and his daughter, Amelia, out on her first ride with us, wisely switched to plan B after a mile or so. (Returning to the car and then driving to the cafe). The rest of us pressed on, taking a shorter route than planned given the conditions. We kept off the roads where possible and arrived safely at the cafe, despite branches on roads, drivers on mobiles and strong side gusts. 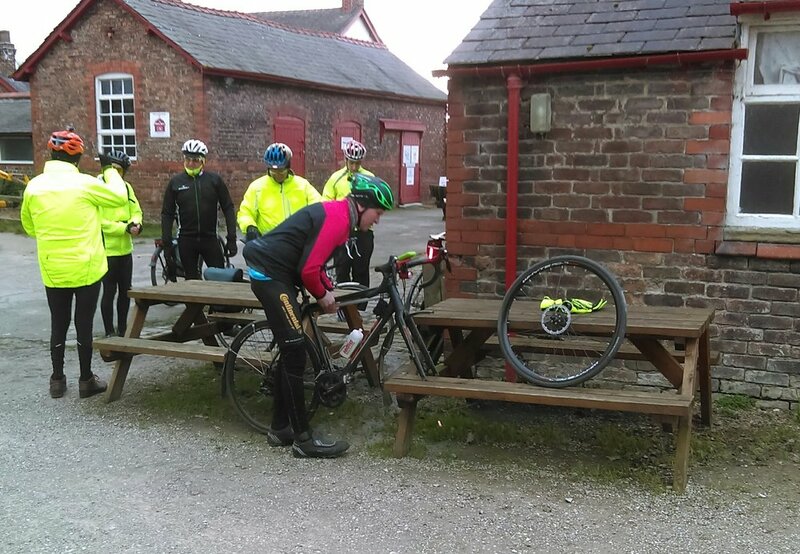 Whilst we were in the cafe it clouded over, the temperature dropped and Phil's bike sprung a puncture. A few hardy souls stayed outside to provide moral support whilst Phil fixed it, and a few of us headed back indoors. The ride back was much easier with a tail wind blowing us home. We had another puncture on the hill up from the airport tunnels , this time Alison's bike, with Martin and Gawsworth John fixing it. We were back in Wilmslow just before 2pm, 24ish miles for Kirsten, Alison, Griff, Phil, Jim, Simon G, and Gawsworth John, with Martin and I doing the leading and back sweeping. Action shot of Phil fixing his puncture!